Do you ever feel self-satisfied with your cooking? Experience that deep sense of immense gratification in feeding your family and friends? I believe that every cook – stay at home mom and grand chef alike – experiences that moment of quiet glory in putting forth their work for judgement knowing that they’ve really nailed it. Basking in just such a moment after a particularly savory winter soup while enjoying some of my apple wine, I was reflecting on how reading antique cookbooks has influenced my cooking. 1. Cooking was hard work, so one should economize when possible. Think about it. The kitchen would have been going from sun-up to sun-down. The stove required constant fuel in the form of either wood or coal, a drain in any household budget. When the fire or oven was up and running, it would have required constant minding. Lesson: Maximize your oven/stove when it’s in use by planning ahead. This practice saves money, yes – but more importantly for a modern working family it saves time. We all know the practice of cooking meals on the weekend to cut down on stress and convenience food binging during the week days. Say you want to make chocolate chip cookies (and who doesn’t love a good chocolate chip cookie? 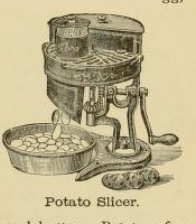 ), the oven can simultaneously be cooking a dish of roasted root vegetables, some baked potatoes, and a custard. Likewise, the top of the stove can keep foods warm using a baine-marie on one burner instead of multiple burners. 2. There were no convenience foods, so if you wanted something, you would need to learn how to make it. I’m not talking about roasting a chicken or baking a cake. Those are obvious. Less obvious are the curries, ketchups, strawberry and mint sauces, coffee, almond, and lemon extracts, roasted nuts, candies – everything. Lesson: With a little patience and time, you can make anything – AND – it is probably easier than you think. I have yet to boil a pig’s foot for gelatin, but I could do it if necessary. Coffee extracts are my current favorite. 3. Cooking required serious planning ahead. Home cooks needed ingredients from one recipe for another. Example: If you needed lard (or suet, as it was referred to) for your pastry, you would need to collect it from your roasted meats. This meant that cooking was an ongoing process of planning and preparation. If you wanted a mint sauce in winter, you would have to use mint extract or dried mint leaves prepared over the summer. Lesson: Always think about your cooking as extending beyond your current meal. Save your roast meat drippings, rendered fats, and bones. Talk about flavor bombs! Soups, roasted veggies, beans – the list goes on. Trimmings from veggies can be turned into stock. If you really want to go hard-core, water from boiled/microwaved veggies can be used to for rice, soup, etc., adding a bunch of vitamins that would otherwise be lost. Dry those unused herbs instead of tossing them out after they’ve gone bad in the back bin of the fridge. Zest your lemons before using them. Freeze, and save for later. Besides being interesting glimpses into the past, reading antique cookbooks has made my cooking more flavorful and creative. Really makes me appreciate what we have. That is so true! I think about it regularly.